The 139th Audio Engineering Society Convention (held Thursday, October 29, through Sunday, November 1, 2015, at the Javits Center in New York City) was the place to be for anyone involved with the audio industry. 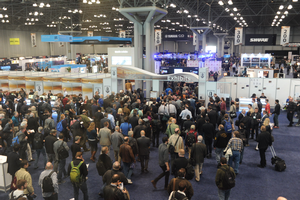 The exhibit floor, panels and technical sessions were packed all four days, and highlights included the Project Studio Expo, Live Sound Expo, GRAMMY SoundTables® panel, and the lighting of the Empire State Building in blue and white in AES’s honor. Registration was near 18,500, with All Access and Exhibits-Plus registrations at an all-time high. The AES 139th Convention also saw a boom in social media involvement. A core team of five web-active AES members worked with three video crews and convention volunteers to ensure consistent posting on multiple platforms from all areas of the conference. Results included increased engagement including more than 10 million impressions on Twitter utilizing #AES139, and a large number of added followers on Facebook and Twitter. In addition to social media, Halloween night got social at the DiMenna Center for Classical Music, as AES teamed up with Vintage King Audio to present Afterglow 7, the biggest ever after-party in the series. Convention Committee Co-chair Jim Anderson and his team created a highly ambitious and comprehensive schedule of workshops, panels and technical programs with a staggering 400 sessions, including the popular Platinum series of panels made up of many of the best engineers and producers.Co-chair Paul Gallo worked closely with the AES marketing team to drive traffic on the convention floor, resulting in a wide representation of attendees from various sectors in the audio industry, including recording and production, broadcast and streaming, game audio, live sound, networked audio, post production, system integration and more. Mick Olesh, Waves EVP of Sales & Marketing, comments, "AES was exceptionally strong this year, with a smooth operation and excellent attendance. It afforded us the opportunity to showcase our new products, and, together with Waves Artist presentations at our booth, to further enhance our relationship with our user base." Steve Strassberg, Dale Pro Audio VP/ General Manager, noted, "Our decision to participate and have a booth at the AES show really paid off. The Convention being in our own back yard made the decision very easy. Our goals were to make some great new connections across all of the vertical markets that Dale serves, and to have quality face time with our existing customers. Our sales team also had the opportunity to strengthen relationships with our top vendors, so, on many levels, it was time well spent." Across all sectors of the industry — recording & production, broadcast & streaming, game audio, live sound, networked audio, sound for picture, post-production or system integration — the 139th AES Convention had it all. With nearly 300 exhibitors, the convention also received support from industry sponsors and partners including: Audio Precision, Auro Technologies, AVID, Cadac, Clear-Com, Dolby, DiGiCo, DPA, DTV Audio Group, Focusrite Novation, EAW, Genelec, Optocore, THAT Corporation, L-Acoustics, Shure, The Recording Academy® Producers & Engineers Wing®, NewBay Media, Lectrosonics, Universal Audio, Yamaha, Neumann, Meyer Sound, Prism Sound, Oculus, VUE Audiotechnik, Sennheiser, Sound On Sound, Guitar Center Professional, SPARS, Sweetwater, Triad-Orbit and Waves. Additionally, attendees and exhibitors were excited about the upcoming AES activities including the AES 140th Convention, June 4-7, 2016 in Paris, France, and AES 141st Convention in Los Angeles, CA, September 29-October 1, 2016. For additional information on the Audio Engineering Society and its conventions, conferences and technological outreach, visit http://www.aes.org.